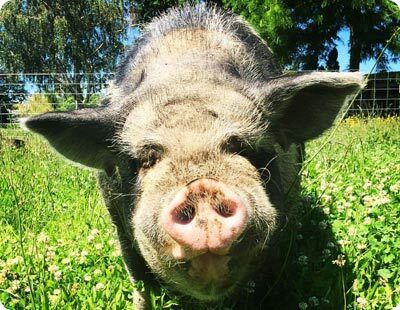 Noble Animal Sanctuary depends greatly on volunteers to maintain a clean and safe environment for the animals and our visitors. 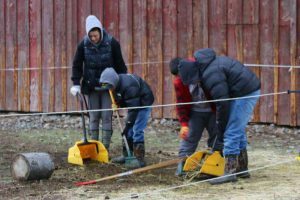 Volunteers are needed to help with field cleanup, grounds maintenance, gardens, and on-site events. Our animals love to have human friends that come out regularly to spend time with them. There are also a number of other ways to get involved with our organization outside of our sanctuary gates. You might help with an fundraising event, support a pet food drive, or spread awareness at a community event table. Depending on where your interests and time availability are, we will find a way for you to support the work we do on behalf of animals. Contact us directly about volunteering your time, or check our events page for upcoming opportunities to volunteer. Bring your team for a day at the sanctuary! We would love to coordinate for your group or company to spend a day at our sanctuary. Sanctuary team days allow you to bond with co-workers, friends, and other animal lovers while supporting the Noble Animal Sanctuary mission. Your team will tackle projects such as painting, building, weeding, cleaning, and other tasks to improve the sanctuary and the animal’s homes. Each team gets a private tour of the sanctuary and an opportunity to visit with many of our animals. If your company or group would consider generously donating its time and service at our sanctuary, please contact us! Would your business or organization like to become a Noble Sponsor? We will feature your companies logo here along with other places on the site for all to see. If you are interested in sharing your talents with Noble Animal Sanctuary, you may fill out the form to get things started. Are you over 14 years of age? Please share what days you are available to volunteer. Please share what time of day you are available to volunteer. Please share how you would like to share your time with Noble Animal Sanctuary. Please share any special skills that you possess and would like to share with Noble Animal Sanctuary.